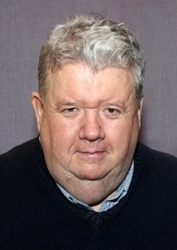 Ian McNeice's television breakthrough was as Harcourt in the award-winning series Edge of Darkness. He has also played the alcoholic sous chef Gustave LaRoche on the television series Chef!, the evil Baron Vladimir Harkonnen in Frank Herbert's Dune and, later, Children of Dune, Burt Large in eight seasons of Doc Martin, and the Newsreader in the HBO/BBC production Rome. McNeice has also appeared in a number of films throughout the past few decades, including 84 Charing Cross Road, Day of the Dead, No Escape, From Hell and The Englishman Who Went Up a Hill But Came Down a Mountain, Ace Ventura: When Nature Calls, Around the World in 80 Days, White Noise, and Joseph and the Amazing Technicolor Dreamcoat. He made his Doctor Who debut when he guest-starred as villain Zeus in the Big Finish BBC Digital Radio 7 drama Immortal Beloved. Later McNeice would become well known in the Who universe for portraying Winston Churchill in the TV series from 2010 - 2011. However, this wasn't the first or last time he would play Churchill. He had previously played Churchill in the 2008 premiere production of the Howard Brenton play Never So Good, and later played him again in the 2012 stage version of The King's Speech. You can follow Ian on Twitter at @ianmcneice1950.